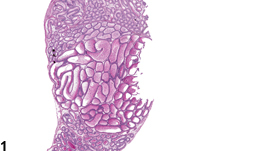 Dilation of the epididymal ducts is an uncommon finding. 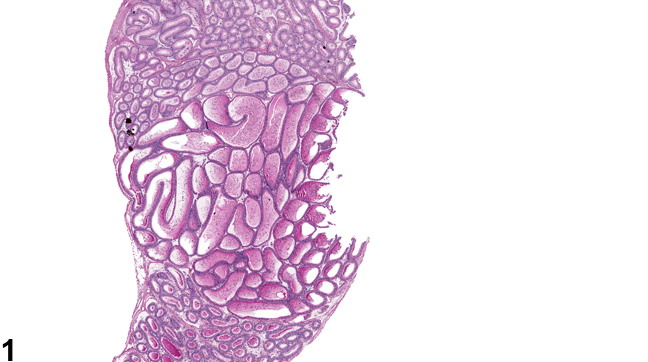 The luminal diameter of the ducts varies significantly in different parts of the epididymis, and this must be taken into account when evaluating the change. The change is usually restricted to a specific segment of the epididymis. It can be test article related ( Figure 1 and Figure 2 ) or can be seen as an occasional cystic background finding in aging rats. Ductal dilation should be recorded and graded and should be discussed in the pathology narrative if the incidence and/or severity appears to be related to chemical administration. If both epididymides are involved, the diagnosis should indicate bilateral and severity based on the more severely affected epididymis. Reid BL, Cleland KW. 1957. 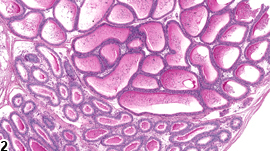 The structure and function of the epididymis: The histology of the rat epididymis. Aust J Zool 5:223-246.